So fluffy compared to our kestrels. And the colouring is less grey and more beige. Beautiful pictures and the grey sky was bonus. Grand close ups Pat!! Boom & Gary of the Vermilon River, Canada. Beautiful shots of a beautiful bird Pat. Nice captures Pat. They really are beautiful birds. Looks like she was waiting for her portrait to be captured. Awesome shots Pat. 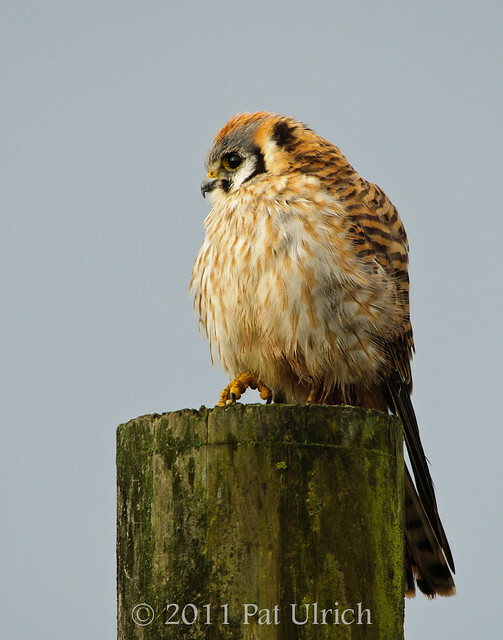 Beautiful kestrel, Pat! I have never managed to get one and I am so envious! That is one stunning portrait Pat! It is our great fortune you were out on the prowl. The matter of fact placement of her talons on the third shot really ups the ante on the other two. How many shots did you take in five minutes? I won't ask you how you find such perfect focus and light, that we know is magic. A very beautiful bird to see and very well captured. Great images. Wow, awesome shots of the kestrel! 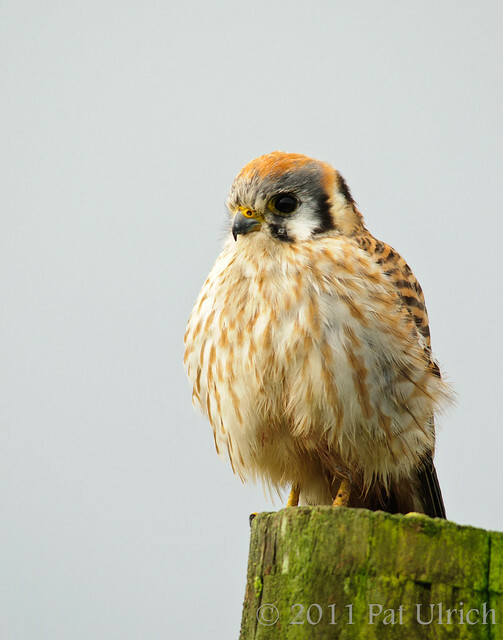 Wow, sensational kestrel images! Always a joy to view your exceptional work. Love the photos- one of my favorite birds! The Kestrel is a beautiful little bird of prey. Your shots are wonderful! Stunning photos as always Pat. A pleasure to view. What an excellent series on the Kestrel...The detail is amazing! Give me quality over quantity every time. Really great captures of the kestrel. You lucky dog Pat! Awesome shots of what was, until recently, one of my photo nemesis birds. 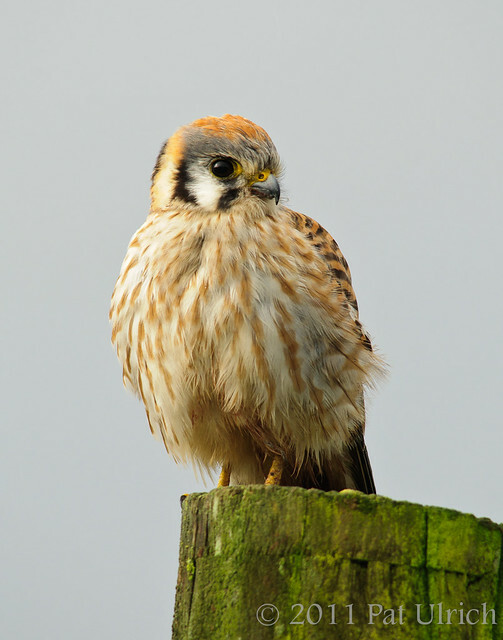 I love American Kestrels and fortunately get to see them all the time. I, like you, had never been able to get close enough to one for a photo op. They always take off on me. I just got lucky one day and a female flew up on a telephone pole across from where I was already set up, waiting on a Harlan's Red-tail, and posed for me. I also think that right after the rains the birds are out feeding. It's a great time for bird watching and pohotography! Thanks, Joco! This is a female, so she doesn't have the slate gray wings like the males do. And I think she was just puffed up a bit since it had recently stopped raining and was cold. Thanks, holdingmoments! I agree that they are such remarkably beautiful birds. Thanks, Frank! She really did pose for me, even as she bounced between fence posts. Thanks, Hilke! This is the first time I've ever been able to get glass on them. They've always flown off long before I had the chance. Thanks, Dave! And lol, I sure hope not! That's the fun thing about photography though, right? There's always something (or many things) that can be improved, and I would love to have another chance to photograph this bird! Thanks, Mike! They really are a special species! Thanks, Paul! Their colors really are amazing, especially on the males! Thanks, Sondra! The conditions were great for getting nice details. An overcast sky and being close to the subject! Thanks, Arija! I agree -- one good encounter like this makes up for the 50 other times they've flown off long before I got there! Thanks, Larry! I think they can very easily become nemesis birds. Most other raptors will wait just long enough to let you think you'll get a shot before they fly off, but this is the first time I've ever even been able to pick up my camera in time to see a kestrel through it.